Sign Central let’s you Create Your Own Yard Sign. 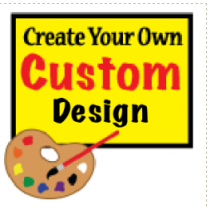 Sign Central is your first stop for Custom yard signs. Sign Central gives you the option to let let one of our expert sign designers lay something amazing out for your event or business Business Yard signs, Political Yard signs, Service Yard signs, Municipal Yard signs, Sport Yard signs, Event Yard signs. Made out of 4mil coroplast sign board, in your choice of one color, two color or full color, single sided or double sided and sizes 12″ x 18″ or 18″ x 24″. Sign Central is your first stop for Custom Political, Contractor, Landscaping, Event & Special Occasion, Business, and Sports Team Yard Signs.